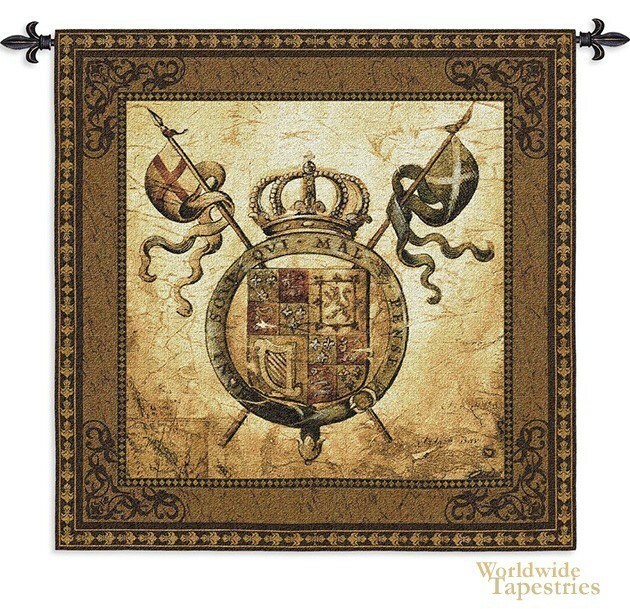 In this royal crest tapestry, we see the work of US artist Elizabeth Jardine. Inspird by the master painters since a young age, Jardine's work shows a strong appreciation of the harmonious use of color, as well as a beautifully balanced composition. In this heraldry tapestry, the central royal crest made of harp and flowers in an emblem design is pierced by two flags on a wistful, almost parchment like background. The predominant palette here is beiges and related muted greens and reds, creating an 'old world' effect. This tapestry "Terra Nova II" is backed with a lining and has a tunnel for ease of hanging. Note: rod and tassels (where pictured) are not included.